Media captionFootage shows the aid convoy reaching "hell on earth"
A UN refugee agency official said the convoy - the first since mid-February - delivered as much as it could in Douma town and left after nearly nine hours. The UNHCR's Syria representative Sajjad Malik tweeted late on Monday that "we delivered as much as we could amidst shelling". "Civilians are caught in a tragic situation." The Syrian Red Crescent earlier said 46 truckloads of food parcels were delivered to 27,500 people, along with health items for more than 70,000 people in the town of Douma. 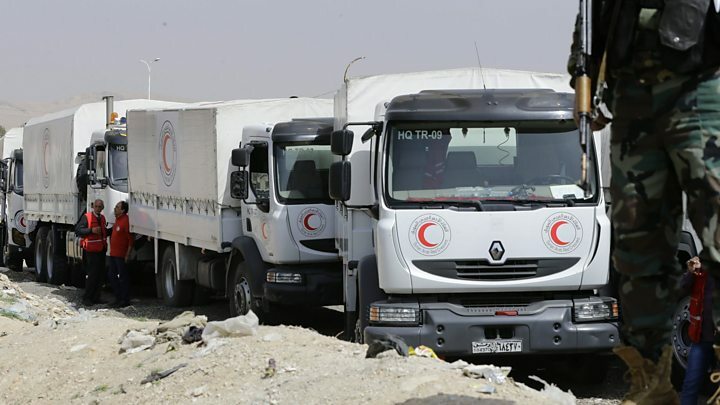 "The convoy is a positive first step and will lessen the immediate suffering of some civilians in the Eastern Ghouta region," said Robert Maridni, Middle East Director of International Committee of the Red Cross. "But one convoy, however big, will never be enough given the dire conditions and shortages people are facing. Repeated and continuous humanitarian access is essential and more must be granted in the coming period." A World Health Organization official told Reuters that Syrian government officials had removed 70% of the supplies, which included surgical materials and trauma kits, from the trucks before they had left warehouses. This is believed to be part of the government's efforts to ensure rebels are not treated. The Syrian government and its allied forces have reclaimed a third of the Eastern Ghouta in a matter of days, according to the UK-based Syrian Observatory for Human Rights (SOHR), which has a network of sources on the ground. The region had been under the control of Islamist and jihadist groups since the civil war began in 2012. President Bashar al-Assad said on state television on Sunday that the offensive against "terrorism" should continue, and he dismissed dire assessments of the humanitarian situation in the enclave as "ridiculous lies". He said he supported a Russian-sponsored daily truce of five hours, to allow "the majority of those in the Eastern Ghouta" to escape the areas under the control of "terrorists". The US has condemned the government assault and said Russia, a key ally of Damascus, is killing innocent civilians. How bad is the humanitarian situation? Neither the daily pause ordered by the Russians - Syria's main backers - nor the ordering of a nationwide ceasefire by the UN Security Council have led to any humanitarian relief for the enclave. The UN says that the "collective punishment of civilians is simply unacceptable". "Instead of a much-needed reprieve, we continue to see more fighting, more death, and more disturbing reports of hunger and hospitals being bombed," UN regional humanitarian co-ordinator Panos Moumtzis said on Sunday. 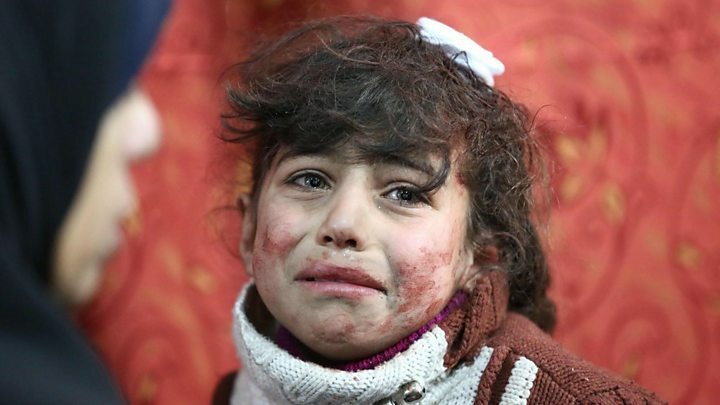 Some 393,000 people are trapped in the besieged enclave. Where are people fleeing to? Opposition sources and journalists on the ground say that hundreds of people have been fleeing the bombardment of Beit Sawa, south of Douma, and on the eastern edge of the densely populated centre of the Eastern Ghouta. Residents, many of them women and children, are reported to have fled into the centre of the enclave to seek shelter. Fighting has intensified in Beit Sawa between government forces and the Islamist faction Jaysh al-Islam. The Eastern Ghouta is dominated by Jaysh al-Islam. But Hayat Tahrir al-Sham, a jihadist alliance led by al-Qaeda's former affiliate in Syria, also has a presence there. 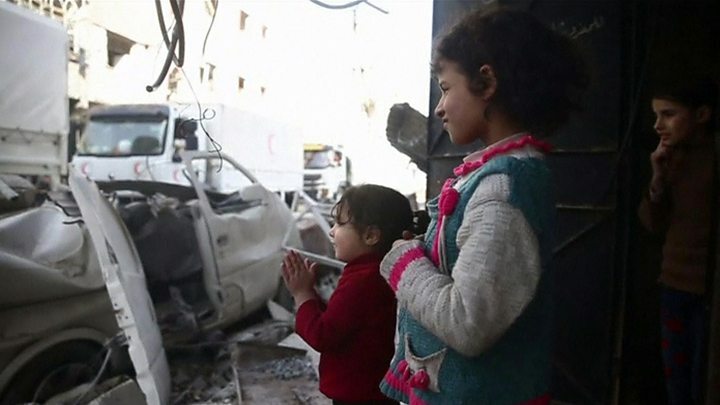 A resident speaking to the BBC described the situation in the Eastern Ghouta as "beyond critical". What is the Syrian government's aim? Several reports suggest government forces are attempting to cut the region in two. Syrian state media say the army has advanced on several fronts, and has taken control of villages and farms while attacking from the eastern side of the enclave. The SOHR said government forces were 3km (two miles) from Douma. The military has been accused of targeting civilians, but it says it is trying to liberate the region, one of the last rebel strongholds, from those it terms terrorists. US President Donald Trump and UK Prime Minister Theresa May agreed in a phone call on Sunday that Syria and its Russian backers bore responsibility for the "heart-breaking human suffering", Downing Street said. The leaders agreed that Russia must act now to persuade the Syrian government to stop the bombing.